* ... CSUB SPORTS: Another twist in the ongoing effort to save some of the minor sports at Cal State Bakersfield. It turns out that Jack and Sharon McGee, owners of Bakersfield Optical at the corner of 19th and Oak streets, helped create an endowment for a golf scholarship when son Jimi died of leukemia at the age of 18. (It was actually Sharon's parents, David and Lori Vordermark, who funded the scholarship) With the golf program now under the threat of being eliminated, the school asked the McGees to use the scholarship in the basketball program. Instead, the McGees will wait to see if the program can be saved and determine then what becomes of the scholarship. If you want to help save the team, call coach Dave Barber at 661-496-8082. * ... GOODWILL: I moved recently from the Southwest to downtown and have spent a lot of time at the Goodwill, dropping off clothes and books and furniture in an attempt to reduce my carbon footprint. Okay, maybe it's just tossing stuff that I never use anymore but reducing my footprint sounds better. Either way, are there happier employees anywhere than the folks who help you unload your castoffs at the Goodwill? Always smiling, always helpful. Whether it's the White Lane or Chester Avenue office, the folks could not be nicer. 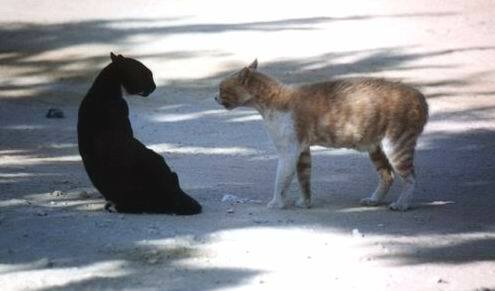 * ... FERAL CATS: I heard from Sandy Dralle, executive director of the local SPCA, about a symposium set for May 22 to address the problem of feral cats. I'm a cat lover and it's clear this is a problem that needs to be addressed. As Sandy said: "All of the cat services groups in town have gotten together to put on this program. Sherry Kotter, the feline coordinator for Best Friends in Utah, is going to come to town and tell us how Best Friends have worked with communities throughout the country to reduce the overpopulation of cats. Last year 11,042 cats were euthanized in county shelters. This is almost 80% of the cats that came into the shelters. We can only solve this problem with the cooperation of the entire community including county animal control, non-profit groups and cat lovers." An added benefit: there will be drawings to provide vouchers for free and low-cost spay and neuter services for participants. Organizers hope to have enough vouchers for almost everyone attending. The cost to attend is $10 for pre-registration (with lunch) and $20 for same day registration. It will be held from 8:30 a.m. to 4 p.m. at the Kern Ag Pavilion at 3300 E. Belle Terrace. Call the Bakersfield SPCA at 323-8353 (ext. 14) for more details. * ... SURFACE GALLERY: One of the bright spots in the emerging downtown arts scene is the Surface Gallery, an eclectic little place run by partners Vikki Cruz and Yvonne Cavanagh. The gallery has a small but loyal following and its fans were disappointed when Cruz and Cavanagh announced it would close at the end of this month. But last Friday Cruz told me she planned to keep it open, possibly by implementing a sponsorship or even membership program. It's not certain if it will stay long term in its 20th Street location near the Fox Theater, but it apparently will survive in a new form. This is one venture that is worth supporting. * ... TILER PECK: Nice to see Bakersfield's Tiler Peck getting more rave reviews as one of the up and coming dancers with the New York City Ballet. Tiler is featured on the cover of "Dance" magazine with the headline "the magnetic Tiler Peck." (read the entire story here) Tiler's mother is local dance instructor Georgia Peck of Dancer's Turnout Academy. Tiler joined the New York City Ballet in 2005. * ... BAKERSFIELDISM: This one from reader Kristina LaVerne: "You know you're from Bakersfield when you remember when the old Jolly Roger in the mall went from a brick wall to a glass wall in their bar. What a treat that was!" Finally, a Bakersfieldism from someone who appears to have actually grown up in Bakersfield. Trips to and fro the East Coast. Tea leaves say: Rico is leaving Bako. Are you smoking those tea leaves? Rico is not going anywhere.